Southeast Aerospace, the first company to have partnered to achieve the first ADS-B STC, has announced its latest ADS-B solution for the Part 29 market. Southeast Aerospace has partnered with Peregrine and Air Methods (as the ODA) to provide a panel and remote mount fully integrated ADS-B solution for a variety of Part 29 airframes. 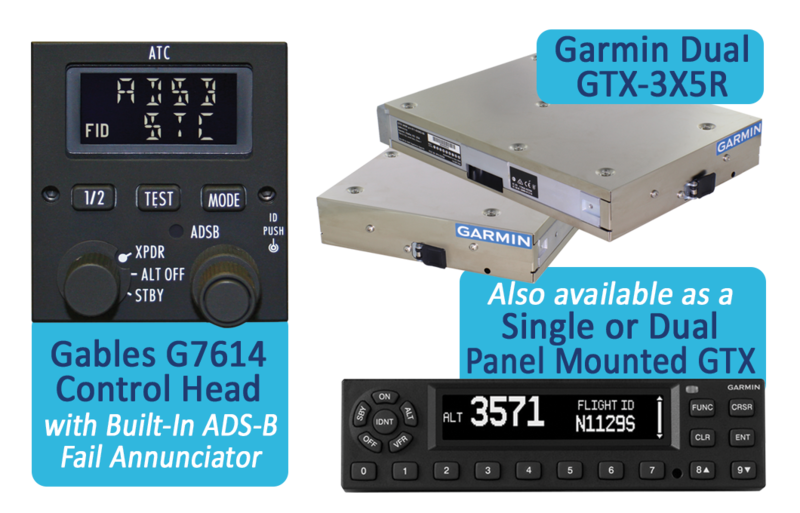 Utilizing a Gables G7614 Control Head and remote Garmin GTX-3X5R or panel mounted GTX3X5, we are offering the STC data and Right to Use (RTU) for those customers who have legacy Part 29 Helicopters. A remote mount feature offers the customer ease of installation for aircraft with existing XPDR controllers installed. Weather and traffic can be displayed on existing Garmin displays or pilot's portable devices, increasing safety and situational awareness. The Garmin GTX series provides 1090ES out, dual "in" (978/1090) receive capabilities, Connext/Bluetooth connectivity for Garmin Pilot, ForeFlight Mobile, and Aera 795/796. The unit also has the optional capability of an internal GPS, removing the need to install or upgrade the existing GPS system in the aircraft. "Southeast Aerospace is committed to providing affordable ADS-B solutions for all segments of aviation. We began our solutions with the single engine platforms, most recently expanding our Part 25 solutions, and now offering Part 29," said Nathan Hernandez, BD/Sales manager Aircraft Modifications of Southeast Aerospace. "2020 is fast approaching, with less than a year left to comply with the ADS-B mandate, Southeast is working to offer low cost, flexible solutions, so that everyone can take advantage of the safety benefits of ADS-B," said Nathan. Southeast Aerospace's Part 29 AML STC# SR00925DE is available for non-TCAS II and includes Airbus BK117/EC145, AS-365's, as well as the Bell 205, 222, 230, 212 and 412. SEA anticipates adding additional aircraft by Q2/19 to include Columbia Helicopters, Erickson Air-Crane, Sikorsky, and more. For more information on purchasing the Part 29 STC package, please visit our website at www.seaerospace.com/adsb-stc or contact your authorized Garmin dealer.